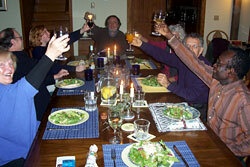 Lifebridge Sanctuary is a sacred meeting space. Our Spirit in the Workplace group has been meeting annually at Lifebridge for the past 8 years. The beauty, the energy of the building, the land, the vision and mission and the spaciousness of Lifebridge provides all we need to do our work. Thank you for creating this space for groups to gather. 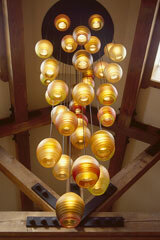 Lifebridge Sanctuary meeting center is designed to meet the highest measure of professional needs and comfort. We offer the ideal setting for your organizations' workshops, gatherings, strategic planning or educational meetings or your board or staff retreat. Throughout four seasons our guests enjoy the natural beauty and gracious accommodations of the Sanctuary - an environment conducive for an outstanding meeting experience. In this tranquil setting we will see to your specific needs and provide you with the opportunity to maximize personal and organizational development. 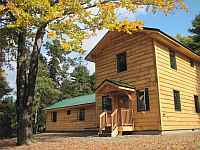 Lifebridge Sanctuary can sleep guests in a range of comfortable rooms, many of which have views and all with high-speed internet access. Check here to see a floorplan for the bedrooms. Talking Stone room sleeps up to 3 guests in with their own full bath. 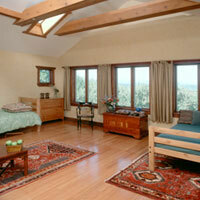 Corner Stone room offers generous views of the Catskills, sleeps up to 5 guests comfortably and includes a private bath. Northern Bedroom - sleeps 4 guests with a full private bath. Southern Bedroom sleeps 3 guests and has a full bath with handicap access. 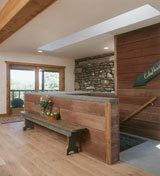 Sunset Alcove sleeps 2 with shared bath of northern and southern rooms - full access to Mountain View Deck. A separate house with mountain views a minute walk from the Sanctuary main building. 8 bedrooms and 4 baths. Complete with a common room with kitchenette. Guests at the Lifebridge Sanctuary can enjoy a range of choices in where they eat and the catering arrangements. The Sanctuary offers a 900 sq ft state of the art Kitchen facility to our guests. 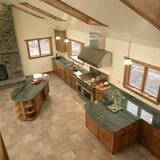 The Kitchen is designed to enhance the group dynamic by sharing and preparing meals together. If you prefer to have your meals prepared for you: The Sanctuary also offers access to the Hudson Valley's best chefs and catering companies specializing in a wide variety of culinary preferences - from gourmet vegetarian to Classical American cuisine. All focus on the seasonality of the rich community farms and organic agriculture the Hudson River Valley is famous for. The Sanctuary Dining Room is 600 sq. 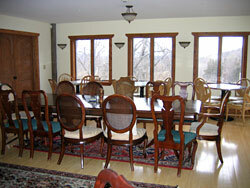 ft and accommodates up to 40 guests. As the season permits, dining can be enjoyed on our hand crafted stone patio; seats up to 30 guests, 780 sq. ft.
For larger day conferences CedarHeart Lodge can be set up for dining to seat 60 guests for sit-down or buffet-style meals. This can be combined with dining in the Kitchen and Dining Room. The Sanctuary offers a 900 square foot state of the art Kitchen facility to our guests. 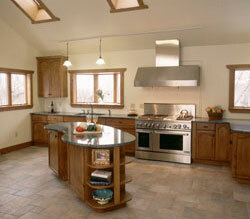 The Kitchen is designed to enhance the group dynamic by sharing and preparing meals together. The Sanctuary offers access to some of the Hudson Valley's best chefs and catering companies specializing in a wide variety of culinary preferences - from gourmet vegetarian to Classical American cuisine. All focus on the seasonality of the rich community farms and agriculture the Hudson River Valley is famous for. Includes: Stonehouse Library (24' x 32'); Dining Room (22' x 21'); Kitchen (900 sq. ft.). 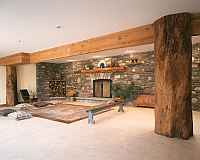 Shows Upper Room (60' x 30') with Circular Seating for up to 60 and Upper Room Porch ('Sitting Room'). Shows Upper Room with Theatre Style Seating for up to 80. Common area with Kitchenette, 2 single rooms, 3 double rooms and 2 shared baths. 2 double rooms with shared bath, 1 triple with bath ensuite. Download and print this PDF document with information on Things to Bring, Transportation, local restaurants, Business Centers, local stores, holistic health practitioners, telephones and computers (the Sanctuary has a DSL wireless service for guests).